A Diamond Select Release - Sculpted by Gentle Giant Studios. The best-selling Marvel Select line is proud to add another of the Marvel movie franchises to its lineup. 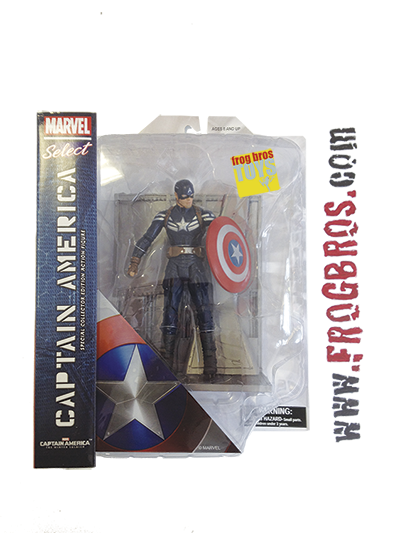 This time, the movie Captain America: The First Avenger makes its Marvel Select debut. Based on the likeness of actor Chris Evans from the upcoming summer 2011 blockbuster, this movie-accurate Captain America figure includes Marvel Select's standard 16 points of articulation. As an added bonus, the figure comes packaged with part of a display stand that can be combined with the base from the Red Skull movie figure (sold separately) to form a diorama, recreating a key scene from the movie.